We think of weather as unpredictable, but the forecast we check is by the hour and it rarely seems to be far wrong. Perhaps it’s a matter of probability that when changeable weather threatens by making a different forecast every hour reality cannot be far away. Today the forecast for most hours was illustrated by a symbol of a sun with a little white cloud beneath it. Only the size of the cloud varied throughout the day, and since we were connected to electricity and had a water supply, that could mean only one thing. Everything that has ever been even close to dirty had a turn of being pummelled to death in the machine, before being sent outside to play in the sunshine. 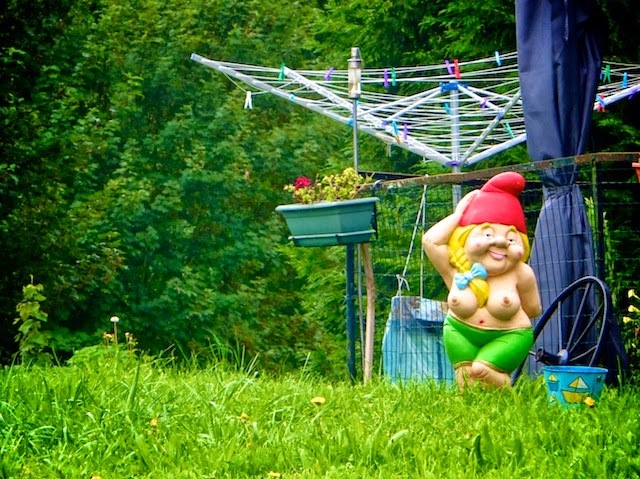 As fast as things could dry or every twenty-nine minutes whichever happened sooner, they were replaced by things emerging fresh from the washing machine. The boat was turned upside down looking for stuff that may have escaped. Production barely stopped for long enough to eat, let alone to replenish our supplies. By the time the white clouds turned to grey and the sun had disappeared, so had the pile of laundry, and pretty much any other sign that anyone else had ever been aboard. Suddenly we felt quite alone. Goodbye Cliff and Gina, hello Superheros! 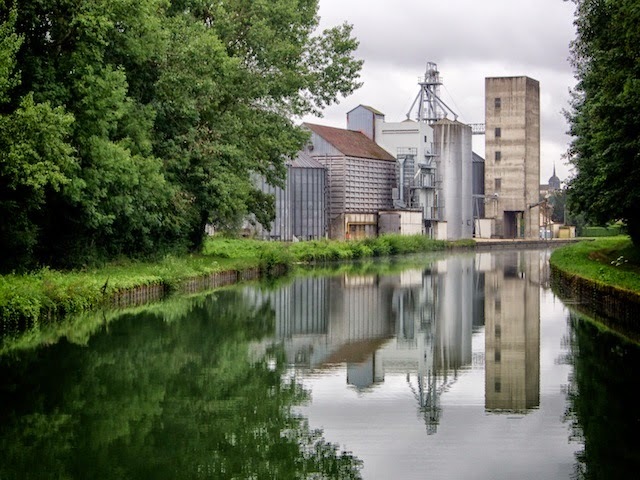 I suppose I should describe the joy of walking around the village of Ligny-en-Barrois, the ancient towers and mills, the parks and river and the amazing little arcades that run under the buildings connecting the squares, or perhaps the gardens atop the remains of the towns ramparts. I should probably mention the inevitable twinge of sadness as we made sure Cliff and Gina were on the bus to the next leg of their own adventure, the pleasure we had from their company and how their visit was all too short. But I won’t, because those sentiments are best left for cards and letters and besides we arrived back at the boat with the dust from the departing bus still in the air to find we had new neighbours. 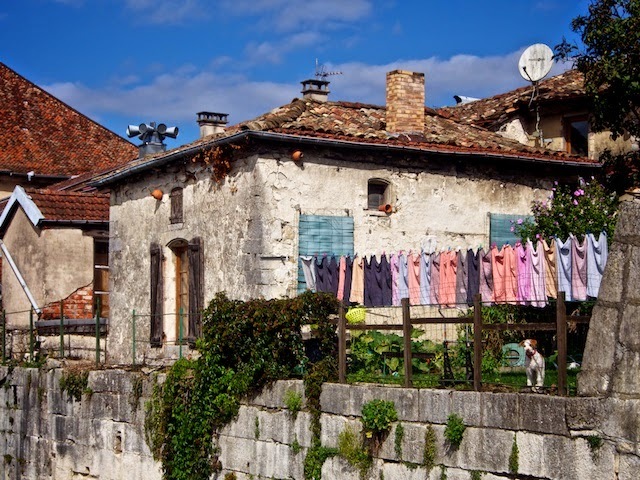 One of our cruising inspirations had arrived in port, the German couple in the raft whose registered name translates to “With Pleasure III” greeted us on our return with a bowl of plums they’d scavenged from the edge of the canal a few kilometres back. We have seen them from time to time, and often use them as an example of the expression “where there is a will, there is a way”. The majority of people dream their dreams then spend their waking hours finding excuses to carry them out. This pair do not, although it helps said the skipper, to have a husband who is a little crazy. The set up reminds me so much of the camping holidays our family had half a century ago, except the trench around the tent is a lot bigger of course. The sides do roll down at night, the stretchers come out from somewhere and the music system is a battered guitar. 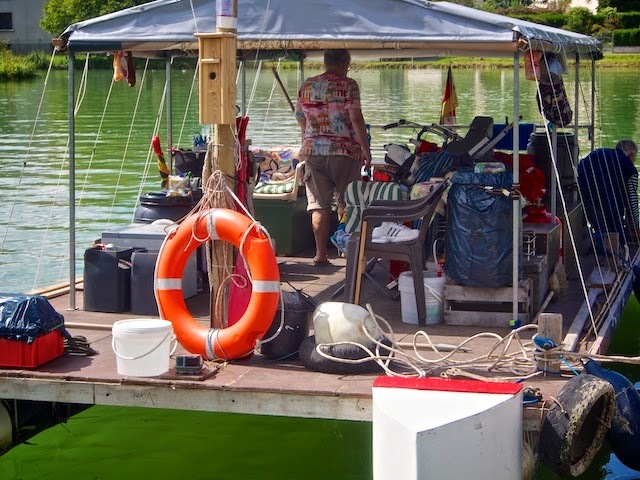 There are no mooring fees involved as at the end of every summer the raft is dismantled stacked on a trailer and stored in their garden under a tarpaulin. No detail has been left to chance. Even the captain’s parrot has a home affixed to the mast. On longer sea voyages, admittedly the space is less comfortable, as indeed is the welcome, but when they left this afternoon, they left us with the feeling that all things are possible. For further insight into just how far this vessel has been, click this link! For those waiting for a better time to follow their cruising dream, be inspired, don't wait! 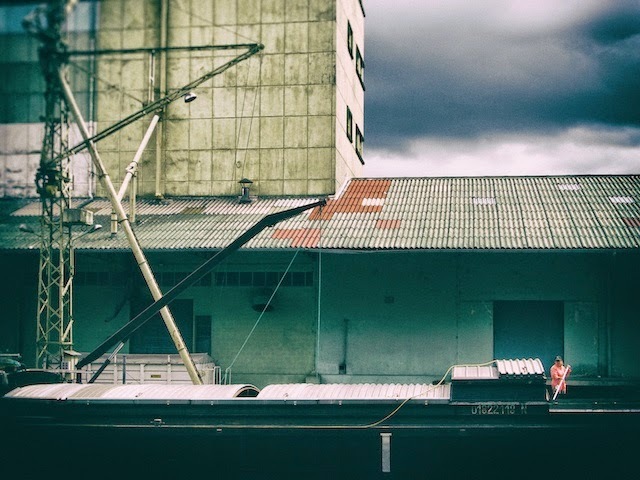 One of the realities of having friends aboard, is that at the end of their stay they have buses to catch and connections to make and the sorts of places we travel through don’t always have ready access to those connections. Therefore, while we wax lyrical about our lack of plan, our freedom to go and do as we please, we are never able to share this aspect of our cruising life. Had we been able to do so, we may never have recovered from our lunch time stop. 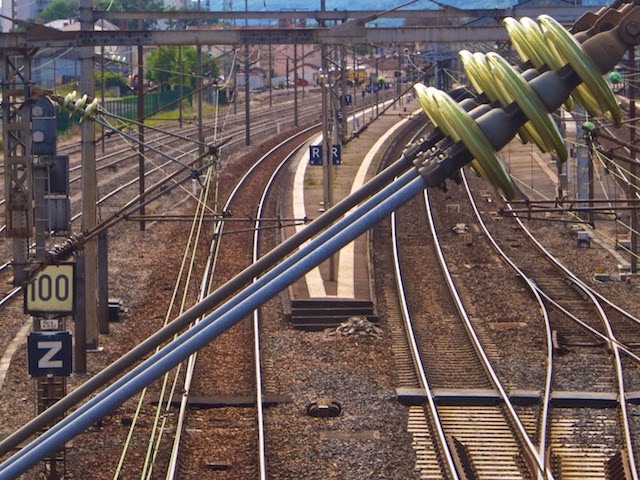 We may well still be in Tronville-en-Barrois for instance, waiting for our mood to change to “move” again. Moving of course is not a terrible impost, and we are heading uphill at a rapid rate once again with locks every few hundred metres. One of the things we can rely on is that with each lock will come a a different experience, sometimes a complete surprise awaits as we emerge from their depths. 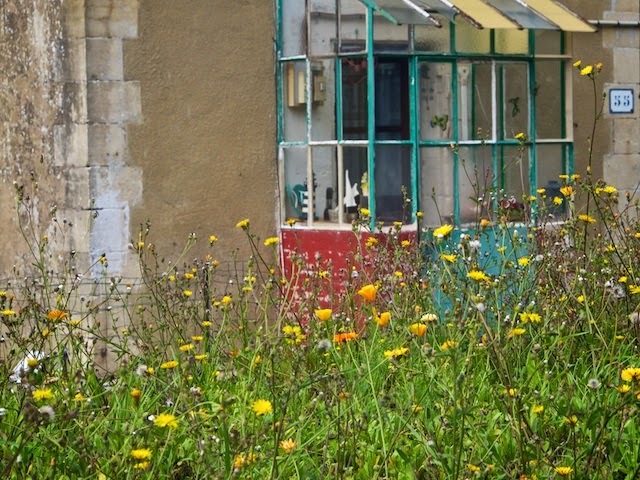 The decoration on each lock-keeper’s cottage for instance varies from “abandoned” to “shabby chic” to “ wildly eclectic”, although occasionally we find one that we’d describe as “imaginative”. Occasionally we find ideas we could possibly incorporate into our own garden. Even this very afternoon we were given a couple of pointers. 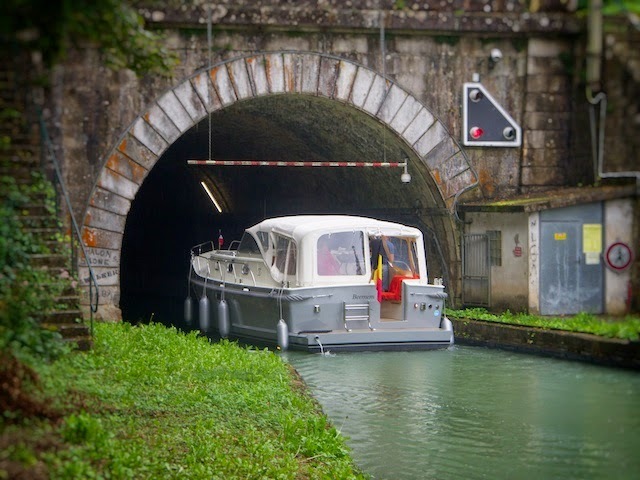 The waterway on which we travel is conveniently located at the lower end of town in Bar-le-Duc. The little port is wedged between the rail lines, the freeway and the bus station and is only a few hundred metres from the village centre itself just beyond one of those Scottish fast food stores that people go into to use the free wifi. Unfortunately for he among us with jetlag and the onset of decrepitude in his legs, the old village, the one where the Renaissance was said to have had its roots, is located a little further away and on top of a hill. Three of us were undeterred, so fitted the fourth with a spare set of hiking poles, implied that it wasn’t as far away as it looked, and set off. The road to the upper village is a rather steep climb until it reaches the top, and then if falls away sharply, this does increase the degree of apparent difficulty for one walking without being able to bend one’s leg appreciably, but it also slows the pace of exploration for those who can allowing time to see details along the way that perhaps had not been seen in previous visits. On the other hand, it certainly is as far away as it looks, and we were all uncomfortable with Cliff's discomfort. For the second time in a week we failed to complete the tourist walking trail. This was not because of Cliff’s injury or tiredness on our part, although none of us were arguing the case for continuing, but simply as it had been last time, that we were interrupted by the onset of lunch. Today with inclement weather closing in we retreated to the boat, where Cliff could rest his legs, and we could rest ours, and we could all continue our breakfast conversations without risk of being tossed out at midnight by an over-tired waiter. The description they had on their itinerary was at best vague: “ Arrive in Zurich 6:10 am - the train takes about six hours.” Perhaps it would in retrospect have been easier if we’d known exactly which train Cliff and Gina were arriving on. All my investigations had shown at least half a dozen changes would be necessary en route and there were at least that many possible routes as well. As it was we knew we had half a morning to get the necessary washing dry in our makeshift drying cabinet, and to find some sort of semblance of order in the boat even if it wasn’t quite up to its shiny best. There was a sort of unattractive drizzle in the air, so while one of us fiddled with calculators and rail timetables to calculate a probable of arrival time and direction, the other of us busied herself with housekeeping, tidying, organising, menu planning and vegetable buying. By late morning, we undertook the first of what would be many sloshes to the station to await an incoming train bereft of our visitors. 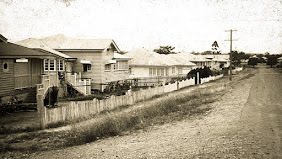 At first we combined these trips with visits to the supermarket, or butcher or baker, but although we were looking forward to the visit, as each train came and went without depositing a load of North Queenslanders looking for somewhere to stay, another small task or two could be completed aboard. By mid afternoon, with only trains from improbable destinations arriving till evening, hopes of seeing our friends today, or for that matter perhaps ever again, were beginning to diminish. At exactly the point when all hope seemed lost, Cliff appeared waving an iPad, Gina not far behind unwrapping a SIM card for her phone. I was until then unaware that waving an iPad was even a method of transmitting messages, but it seemed quite effective in the end. When it comes to communicating with computers, Cliff is clearly in a different league to the common man. When travelling in a country where trains are obliged to slow to a mere one hundred kilometres per hour when negotiating busy stations, but need only drop to two hundred for the lesser ones, distance is covered at a remarkable pace. But perhaps its the very speed with which we move that creates a certain fatigue at journey’s end. Surely it couldn’t be the constant round of social engagements, the food, the drink, or the sunshine? I don’t think for a minute that the walk through Paris this morning and the post-luncheon dash to the train could have contributed. Whatever the reason, it was late afternoon when we arrived home, and we looked at the list of things that absolutely had to be done before Cliff and Gina arrived tomorrow and decided that they would best be tackled after a long lie down. 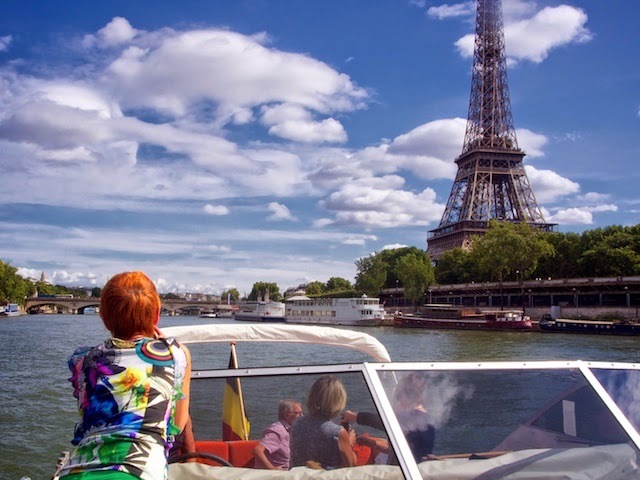 There is no point having friends with boats in Paris if you can’t convince one of them to take you for a cruise. With prospects of rain for the rest of the week it didn’t take too much to convince Dave and Ria that it would be in their best interests to bring their departure day forward to take advantage of the bright sunny day. Once they were in that frame of mind it didn’t take much more to convince them that Max would be so much more stable on the river if another say, half a dozen people joined them for the first part of their journey. 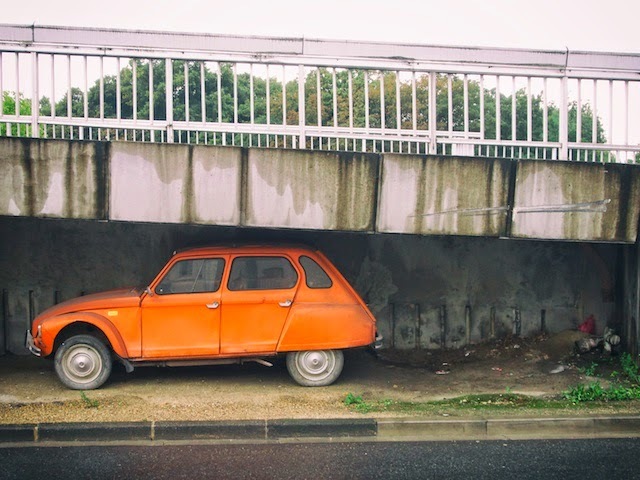 That would be the part of their journey that takes them beneath Paris’ famous bridges, by all the landmark buildings that each week millions of people travel across the world to see. We are all hardened veterans at this sort of thing, not easily impressed, but even the twelve or so kilometre walk back to the Metro station didn't dent the smiles on our faces this day. We do remember walking to the station in Bar-le-Duc with John and Elaine of course, but just when the decision was made that we would accompany them as far as Paris is unclear. 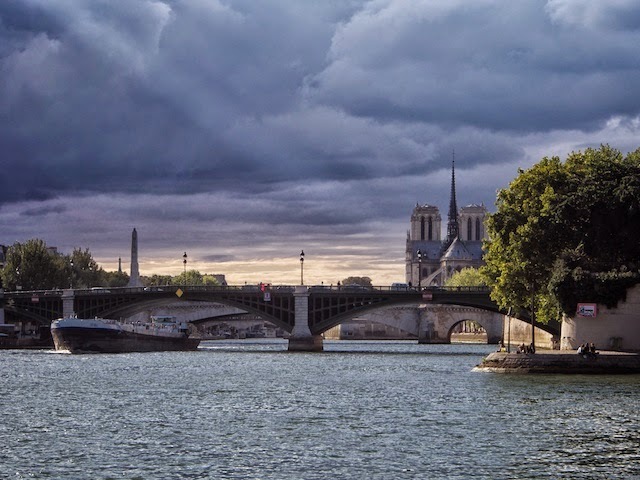 We therefore may never be certain of exactly how it came to be that this evening we found ourselves on the banks of the Seine, sitting in what would have been the shadow of the Cathedral of Notre Dame were it not for the clouds that insisted on getting in the way. Yet there we were on the river bank among the near naked Parisian sun worshipers, surrounded by an eclectic collection of our friends, eating watermelon, and sipping on champagne (or something lesser for those among us with more prosaic tastes in beverages) as a prelude to dinner. Dinner progressed as did we all from boat to boat until finally long after the glint had disappeared from the July Column at the Bastille, the last of Dave and Ria's "George Klooney" coffee had been dispensed and we made a home for ourselves in Grahame and Aileen’s aft cabin. We are not sure yet whether the timing of Ron and Robin’s upholstery repairs was co-incidental, but we have noted the efficacy of this ploy in turning away potential overnight guests for future reference. Every now and then, for reasons that are not clear to us the reality that is our life, seems more like fantasy. We think of ourselves as “travellers”, not “tourists”. We like to think we are aloof from the beat of the normal tourist trail, no matter where we are with no urge to tick off items on the tourist guides. Mostly we don’t even have a guide, preferring to discover in a hap-hazard way the delights or otherwise of our new neighbourhood. But in Bar-le-Duc once again, with just one day to show John and Elaine that we had been paying attention on our previous visits, we found it easy to fall into the role that so often we eschew, wandering the streets and rediscovering the ghosts of the town’s long and chequered past as well as the ghosts of our own happy times. They are in training for the next stage of their journey, a walk across the Pyrenees, which probably accounted for the lack of complaint as we pushed them ever upwards through the old village despite increasing hunger-induced fatigue as lunch o'clock became perilously close to passing. Fortunately we fell under spell of a siren call of a cafe in the nick of time. Safely seated in its clutches we all too quickly found ourselves "traveller" mode, allowing the sights unseen to remain that way for another day. Last evening, while rambling along the canal bank somewhere between picking plums and scavenging walnuts, Elaine spoke to a mother and daughter in her best French. It turns out that the blank stares she received in response weren’t for the reason that I receive blank stares. It wasn’t that her French was unintelligible to a French speaking person rather that it was to someone used to conversing in Italian. As is often the case English was the common denominator, and a lengthy conversation ensued. 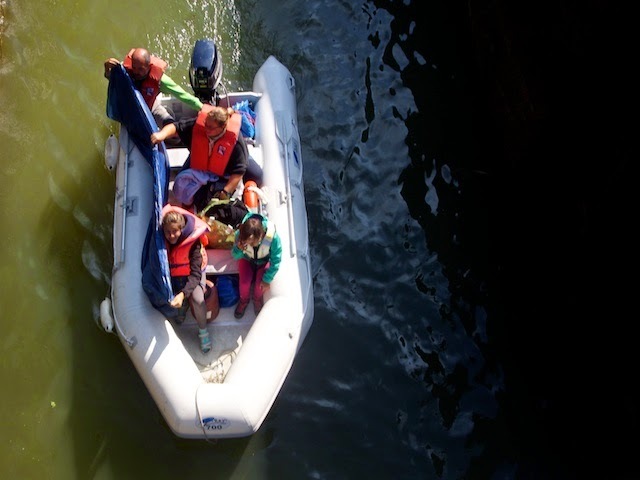 It transpired that the two were part of a group, a pair of Italian families travelling in company on the same number of inflatable boats, having a proper adventure. We derive a great deal of inspiration from people like these when our paths cross. Not for them the “buts” that so often prevent dreams and ambitions from reaching reality. They don’t stop to think of the obstacles, they just get on with it, crossing bridges, or going under them, as they come to them. They carry little more than lifejackets for the kids and a couple of cheap tents (which they will find useful in separating themselves from the six degrees which is tonight's expected overnight minimum temperature. Their singing and their smiles as they left the lock this morning, sadly for us headed in the other direction, remained with us as we climbed the remaining twelve or so locks to Bar-le-Duc. We’ll be thinking of them as we reach for the heater switch in the wee small hours of the morning, and we will be comforted by the fact that that they’ll be in high spirits from their continuing adventure, although I suspect we may be more comforted by our extra doona and thermal bedsocks. 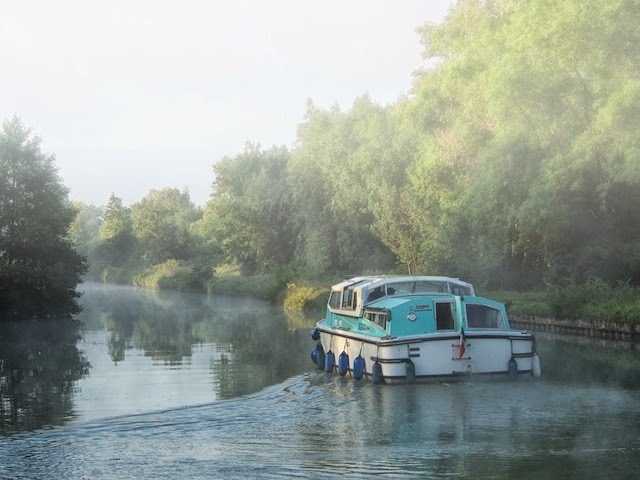 Vitry-le-François is a place that breeds pleasant memories for us, fond ones even, so it was with a little reluctance we sailed out quite early this morning no doubt impressing John and Elaine with the early rising and punctuality that have made us legends on the French waterways. If we had been travelling in company with Al and Sunny today as we were on the last occasion we sailed this route, (Is it really only three years?) it would have taken three days to get to where we are tonight, probably four and we would have been doing everything in our power to slow them down further, to make sure they took time to smell the canola, or the daffodils or whatever the heck those yellow flowers were. But we aren’t, and without Al to share his vast knowledge, we blundered on in ignorance through fields of corn and sunflowers, past gardens with yellow things growing that might be dandelions for all we know. But we don’t because in averaging almost four kilometres per hour today, and travelling without ceasing, except perhaps for a time that may well have coincided with lunch o'clock, we didn’t have time to smell ‘em. Rest assured this is a temporary state of being. It’s a one day wonder. To save unnecessary wear and tear on our guests, normal transmission will resume tomorrow. Never make a joke in someone else’s language. Should you choose to ignore this advice, make sure that your large and looming figure cannot be construed to be blocking the doorway to your shop in a threatening, dare I say dominating manner. 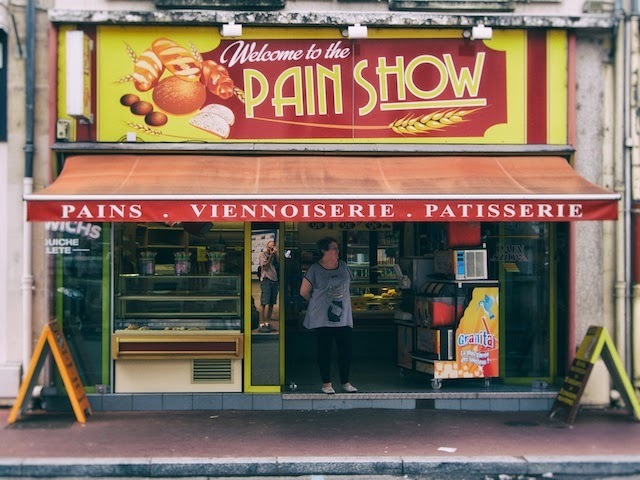 It is just possible that the customers of this bakery do not understand the words “welcome” “to” “the” and “show” in English, but thankfully it is probable that they do understand that the word “pain” in fact is French for “bread”. The good Captain, well on the way to recovery from her little slip of a few weeks ago has probably, not to put too fine a point on it, overdone things in the last day or two, and was walking slowly if not quite gingerly by the time we met John and Elaine at the station this afternoon. The other of us, having likewise travelled a kilometre or ten too far today was feeling his knees a little more than he’d prefer. John and Elaine, fit and ready for yet another feat of overland walking endurance, were not so constrained. Or weren't until John, deciding to test that particular theory in physics which asserts that flying is the act of throwing oneself at the ground and missing…. failed to miss. Propelled by his backpack and shouldered duffel bag, it was only the skin of his knuckles which turned a major faceplant into a lesser one. He survived spectacularly with minor injuries that have left him looking not dissimilar to a half completed mummy, but will live to buy bread another day. Welcome to the pain show. Cold and rain are not words that we normally relate to sightseeing, and while in truth we didn’t really have any sights that needed seeing, rather than step outside the bounds of normality we declared today a day of housekeeping. That’s all very well, except that “housekeeping” involves shopping, and refuelling and given that the shops are more than a kilometre away and the fuel even further but in the opposite direction, it also involves walking a very long way in the rain, and worse, walking a very long way home again laden with either food, drink or fuel. Three trips to three supermarkets and a bakery take approximately six kilometres. In the case of diesel, it’s seven trips with a twenty litre drum and fourteen kilometres travelled. But the afternoon was perfect for lying around and reading. And still they ask when we return to the Antipodes, how we retain our svelte forms despite the time we spend lying around and the volume of cheese and pastries we no doubt consume. It seems we woke Ian as we were leaving yesterday, although I suspect given the stealth with which we departed he was probably already awake and sensibly lying in his bunk when he heard our muted and surely almost imperceptible departure rattles. He was awake enough to leap out of his bunk and take this photo, which I think goes a long way to confirming all that I may have written yesterday, (right down to the fairy eye-shadow, Michel!). But that was yesterday and for now travelling through a landscape of Constable-esque inspiration is a thing of the past and for the future. 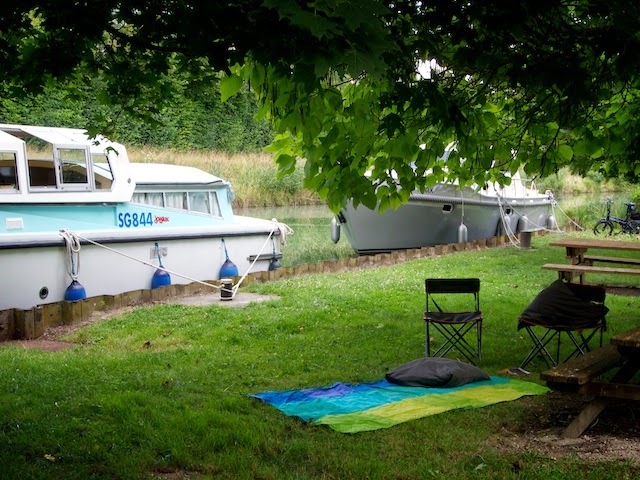 For now we are moored in the tiny boat basin in Vitry-le-François, in a pleasant, leafy suburban street within shouting distance of a shipyard. It’s Sunday though so there is no shouting. Sundays in France follow a distinct pattern. They start of quietly enough, there is no movement outdoors at all except perhaps for the occasional padding of someone almost apologetically walking a dog. Somewhere in the morning a church bell rings, then rings again at midday or one, reminding the faithful and everyone else, that it’s lunch time. The streets then become truly deserted, and for the next four or five hours true silence descends, just as it did yesterday at our mooring after we had left. Technically today was a public holiday. Given our particular kind of vagrancy, we are denied any benefit from public holidays anywhere in the world. We have to just plug on stoically going about our business as though the day is just same as any other. Today wasn’t the same of course. The thought was there, niggling away in the back of our heads, that given the already substantially vacant state of the town centre, on an overcast and possibly cold and damp public holiday there may not be a single living thing to observe in the town all day. We therefore took the only sensible option, falling so easily back into our routine and moving on quite early into the grey of the morning. We are currently travelling on what is no longer, but was only a few years ago a busy commercial channel. Bits of infrastructure bobbing out from the forest from time to time, much of it retired and spending it’s time sitting by the canal and staring into space wondering about public holidays no doubt. As we glide past we wonder about its future. Will it fall to rack and ruin, prey to looters and squatters and vandals, blotting the landscape and eventually being overcome by rust and neglect. 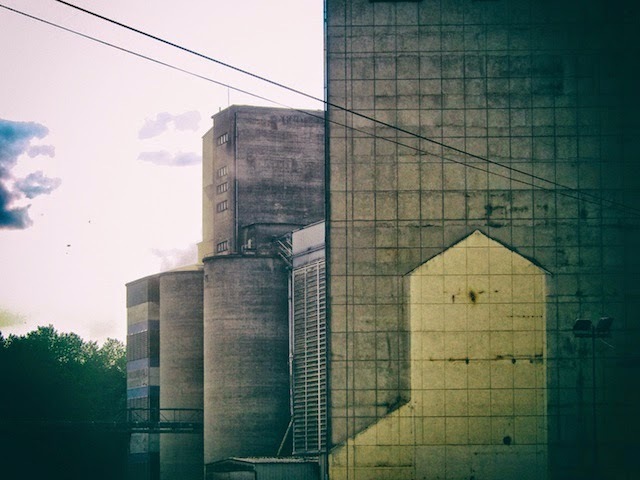 Or will some benefactor appear as if from space and find a new life for the factories and silos, as we did for our boat and Mr Perkins himself. We were allowed to wonder, it was after just all another happy day in the office for us. Ian hadn’t brought a map. Actually he didn’t have a copy which was a reasonable excuse under the circumstances, although he may have had a point or two deducted had it been some sort of leadership test. Eventually we found ourselves about eight kilometres along our intended fourteen kilometre bike trail in an outbound direction, with no turn in sight. There wasn’t even a hint that there would be a turnoff now or at any time in the future, so once we had determined that finding the intended route was improbable, we decided to return the way we had come. There is nothing wrong with being lost of course. 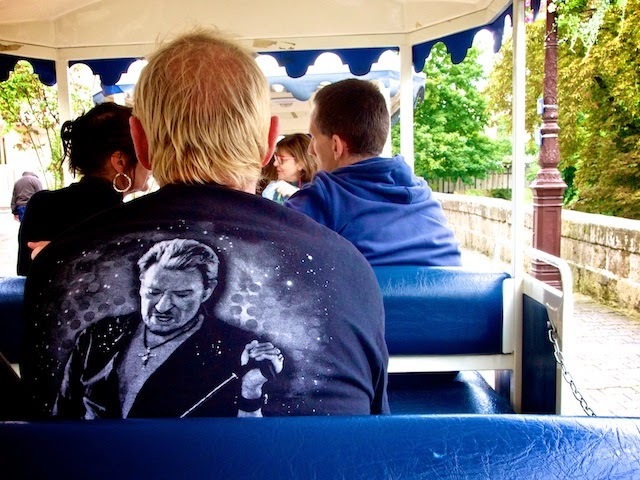 Apart from riding on the fake tourist train with the Johnny Hallyday fans it’s the best way of seeing things in an unfamiliar place which is precisely why we wandered off into the clearing skies of the afternoon with no particular destination in mind. It’s a pretty place, we like it here, we like the parks and the back streets and the colours and the waterways and the little bridges and the poignancy of the memorial statue with the patriot tied to the execution stake staring defiantly at the (figurative) firing squad, ready to go calmly where he must, the a live pigeon standing equally as resolutely on his head, daring them to fire. We'd like it so much we'd like to visit some of those things again next time we are here, but we have almost no idea where we were. We didn't take a map either. Wednesday is market day in Châlons, and there’s a splendid and somewhat ancient market building which probably had we not been there this morning, would have been bustling with farmers offering fresh produce to the throngs of customers flocking in from the surrounding neighbourhoods. 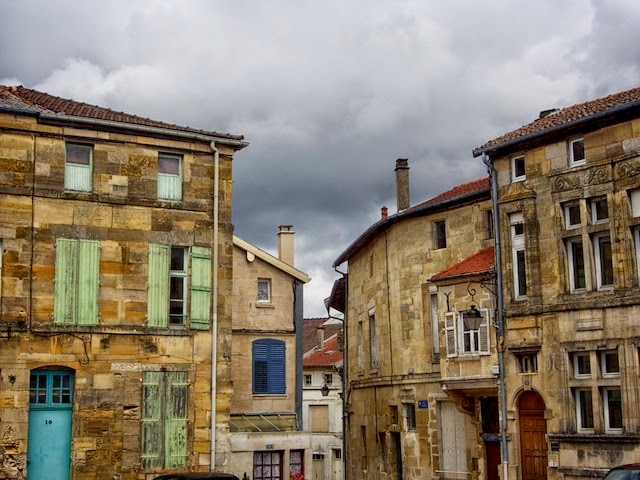 We thought it prudent to allow a few hours for the crowds to thin a bit, so roused ourselves around nine, fortified ourselves with coffee before braving the chill and the rain and quietly so as not to wake the rest of the sleeping town, ambled through its streets. 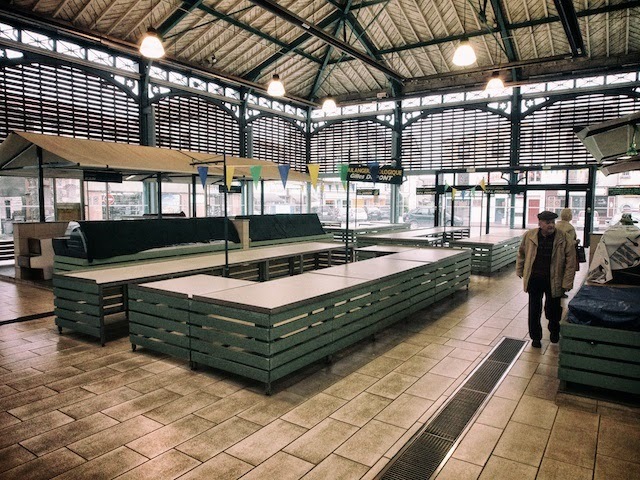 Even at that late hour the market place and the building itself barely showed any signs of life. Many of the vacant counters displayed simple apologies advising that the stall holders would be late this month, and may not actually be here at all next month either for that matter as they’d gone to visit someone in Australia or Africa or some other far flung and no less exotic continent. Thankfully enough traders actually turned up to address our simple needs, so there is little chance of us contracting scurvy, at least on the next leg of the voyage. 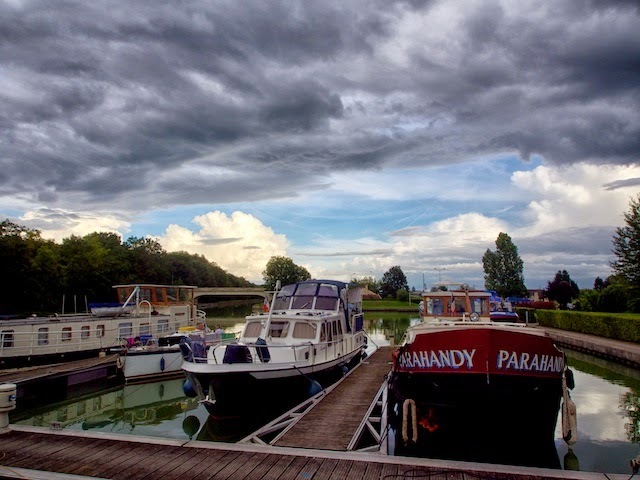 We arrived in Châlons-en-Champagne a few years ago late on a Saturday bravely proclaiming ourselves to be in cruising mode, staying but one night and promising ourselves we’d come again. On the Sunday everything was closed so we had a nice catch up with Bob and Anna and left after making a note to stay for longer next time. Now is that time, and we are determined to stay for more than a few days, but the town seems to have been given advance notice of our arrival. No matter where we turn things are closed, the bakeries are on holidays, everyone has gone not just for one day, or one afternoon, but for the rest of summer or until we have left, whichever is the sooner. 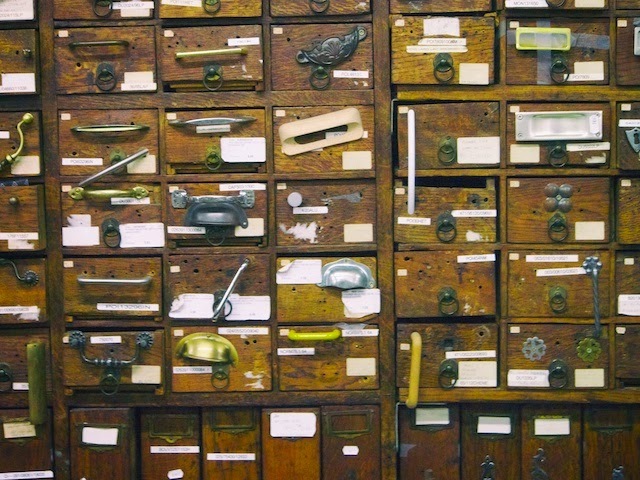 Everything seems to be away in little boxes or drawers like the ones in the little hardware shop (which had everything but the one thing we needed), to be brought out again once we are safely somewhere else. Tomorrow we’ll wander the deserted streets to spite them all, perhaps we'll find that someone is still at home, or perhaps we’ll join them at the beach. Bluey and Davo say Goodbye! Today was to be our last day in company with Ria and Dave, and the sky turned appropriately grey to honour the occasion. That was all very romantic of course, until it decided shed a tear, and then the first lock of the day went out in sympathy leaving us waiting in the cold and the rain to think of the forecast that heralded wind and wonder if we shouldn’t leave our parting for one more day. There’s a “stupid” switch in our brains located just beside the one that makes us move on from time to time, and someone must have bumped it, because we didn’t turn back, we soldiered on, if that is even possible by boat. Perhaps we “navied” on” with the invisible umbilical cord that has kept us tied for several weeks stretching in the pounds and contracting, bringing us back together in each lock where conversations could resume, until we arrived at the tunnel where we would be forced to travel one boat at a time, finally forcing our separation. There, we watched as Max took his turn entering the two kilometre long cave. A strange feeling descended on us, like watching a child ride a bicycle unassisted for the first time. He was on his own. But we met again in the evening, and caught up with Ian and Lynda as well for the mother of all farewells. Bluey and Davo, it’s been a blast, we’ll see you again soon! Over the past few years we have been slowly removing the signs and stickers that have littered various parts of the boat urging us not to smoke, stand on the roof, throw razor blades down the toilet and so on. We have a set routine for warning others to hold on while descending the aft steps as well, they are very slippery. Perhaps it is because we don’t have a sign there, that one of us, after carefully demonstrating to Jenny and Colin the correct method of holding on and taking care, immediately demonstrated the incorrect method. The injury could have been worse. As it is in that perverse turn of logic that describes one as “lucky” that the accident could have been worse when if one had been truly “lucky” there’d have been no accident, and even after almost a week the “lucky girl” still whimpers a bit while transitioning from horizontal to vertical. So today a lay day was called, one in which she was forbidden to move from the horizontal, and she didn't either, except to wash everything that wasn’t bolted down. I have made an “out of order” sign to hang on the machine for next time. Cloudy with some blue patches. Jenny and Colin were to leave today just after lunch, but the morning’s communication advised that their car would pick them up at midday, an hour earlier than planned, changing the atmosphere inside the boat from a bright blue to some sort of light grey melancholy, not terribly unlike the sky outside. We were hoping they could stay a little longer really, just a few more hours perhaps. Hoping the car would be late. It’s silly really, wanting to eke out a few more minutes of a visit that’s lasted several days, but we were. But we are also fickle friends. Ian brought news of his adventures last night in a nearby restaurant, recommended in the Michelin Guide, with prices affordable for mere mortals. Minutes later Dave and Ria discovered that it had a lunch-time discount on weekdays and suggested that we might like to join them. 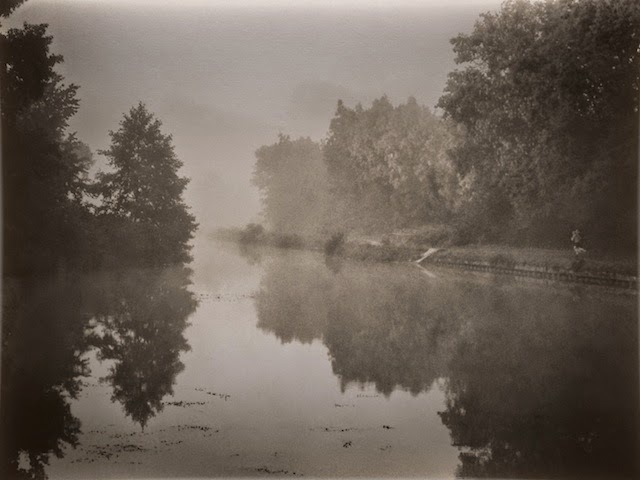 Suddenly we were hoping the car would arrive early, or at least on time, so that we could hustle our soon to be dearly missed friends away and move on to something more exciting, but when it did arrive we wished it hadn’t and the sweet sorrowful mist of parting descended once again. It was nothing a great lunch couldn’t fix though. Dave’s attempt to emulate the illuminations of the cathedral this evening armed with only a single flashing white light were in all truth a poor second to the actual show just ten kilometres to our north. Despite all the stories to the contrary Reims was not a terribly bad spot to be moored. On the other hand it wasn’t a terribly great place either, and we didn’t have to dig too deeply into the complex reasoning parts of our brains to decide that Sillery may well be a little quieter place to spend the evening. We had time though to be tourists for a bit to try to get to know the place a bit better. The six of us having decided on our way home from the lights last night to be out and about first thing, bustled around with intent and actually managed to arrive at the tourist office by eleven, just in time to take the last seats on the last bus tour of the city for the day. 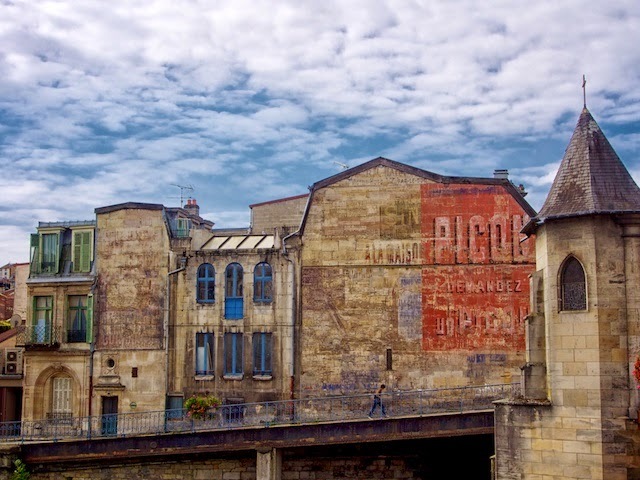 We were all inspired by this taster to spend more time in Reims, but to a man decided that it wouldn’t be today. We were chasing tranquility we decided, although we also decided unanimously that that could wait till after lunch. 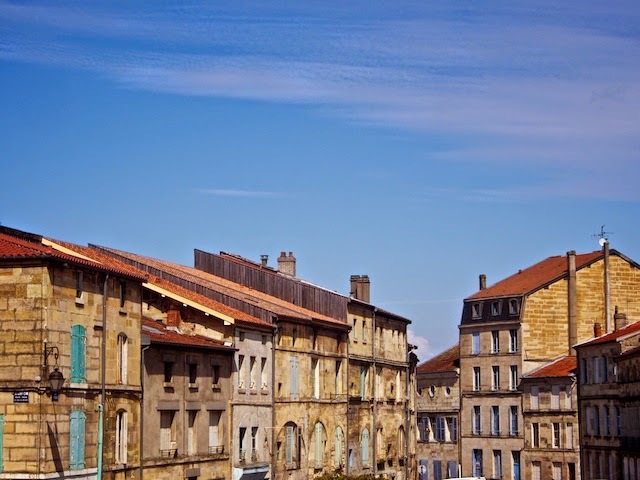 By late afternoon we were in another town, a quieter one initially, but as our little party for Colin’s impending birthday got into gear we feared that others may have wished for the relative calm of Reims and a light show that was brighter than even Colin's birthday candles. Dent: “I don’t know, I never listened”. 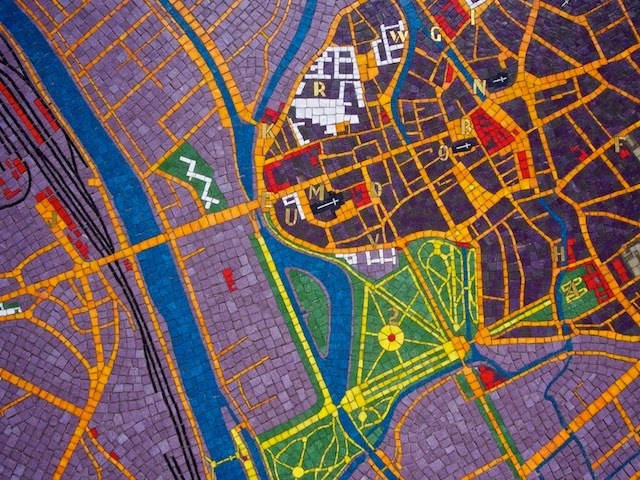 Contrary to every piece of advice we have ever received, we stopped in Reims, in the port, in the centre of town. That would be the one that has been described variously as “opposite the freeway, beside the bridge and under the elevated freeway with it’s population of some sort of lesser beings”, or “ a bit noisy”. It was raining when we arrived, quite without relent and we’d already travelled a not very tiring but none the less quite uncivilised thirty kilometres (with a stop for lunch) and since Reims is the most logical place to stay if one wants to view the Reims cathedral illuminations, against all advice, we stayed. The noise isn’t too bad, and the view is OK for the engineering aficionados among us, although at last count there were none in our number. Motor racing fans pay vast sums of money to experience a similar sensory assault. 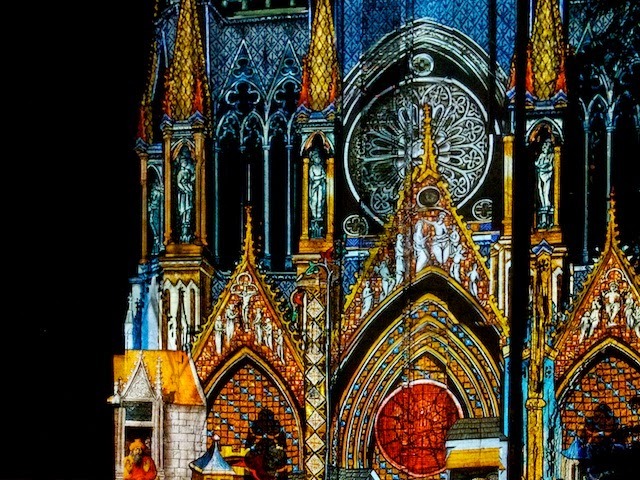 The inhabitants below the freeway wished us no ill, and the cathedral light show was stunning. The light show notwithstanding, we have to admit there other places which could lay claim to providing more tranquil surroundings. Deadlines are the enemy of the cruising class, and we woke with a deadline. Ria had an appointment with her hairdresser today, and we have Colin and Jenny arriving in Rethel tomorrow as well, so it would have been particularly poor form if any of us had slept in rather than busying ourselves for the arduous voyage ahead into indifferent but forecast to be clearing weather. 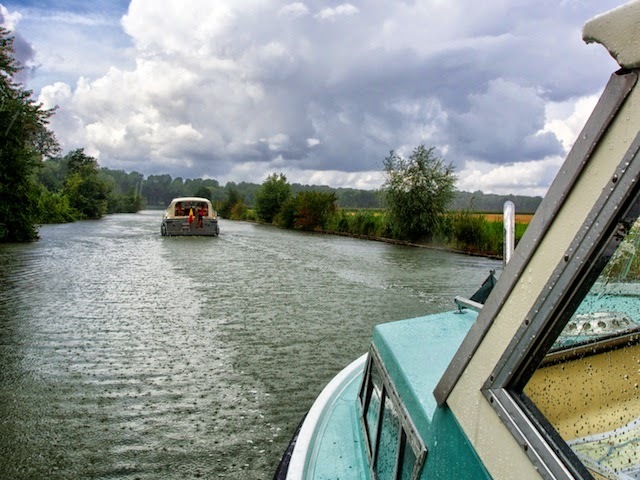 We had to steel ourselves for a day that promised eighteen kilometres of canal through forest and farmland, broken by four locks and as it turned out a rain squall of sufficient intensity to make us grateful for our now almost not leaking at all cabin space. Dave and Ria did not escape unscathed however. I suspect it was the challenge of battling fifty millimetre high waves at the peak of the storm that had distracted them, but whatever the reason the windows in their saloon remained steadfastly open while the sky impersonated a fire hose trained on their interior. In a flash their fresh baguette was ruined. If the storm had continued unabated for a few decades, they may even have been in danger of sinking. Life on the canals is not for the faint hearted, nor for those who don't like soggy bread. There is an old saying in Belgium apparently, that one goes south for holidays so that one can “live like a god in France”. I am fairly certain now, having searched every known corner of the internet for a god with a Perkins as a propulsion method, that we don’t actually live in that manner although in all probability the expression has been corrupted from the original which once read: “living like a dog in France”. 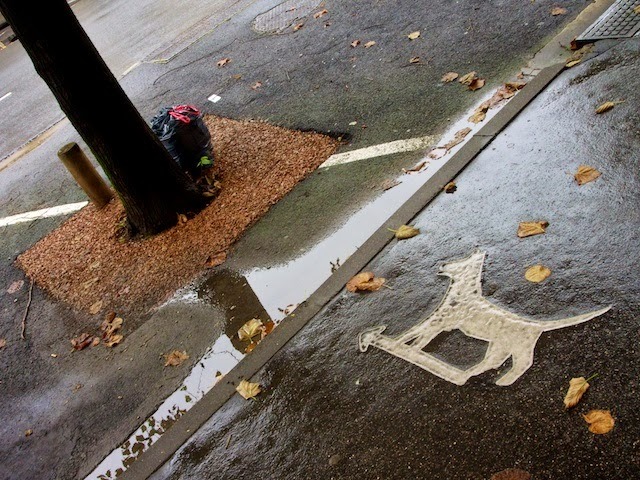 There can be no doubt that in France, dogs are in charge. They go places where they would not be allowed to venture in other places. Certainly there are some similarities of habit between us and them. We seem to spend a lot of the day variously lying in the sun or the shade depending on which was warmer or cooler, thinking only of our next meal, trying desperately to forget from the strains of another eight kilometres travelled. There may have been other choices in Attigny this evening when we decided to dine out, but the first place with an “open” sign was a pizza specialist, with a wood fired oven, decor comprising a mix of stuffed badgers, medieval weaponry and tasteful lithographs of dismembered warriors above each table, while a choir hidden inside a musical device sang “Silent Night” in the background for good measure and there was a dog in charge. 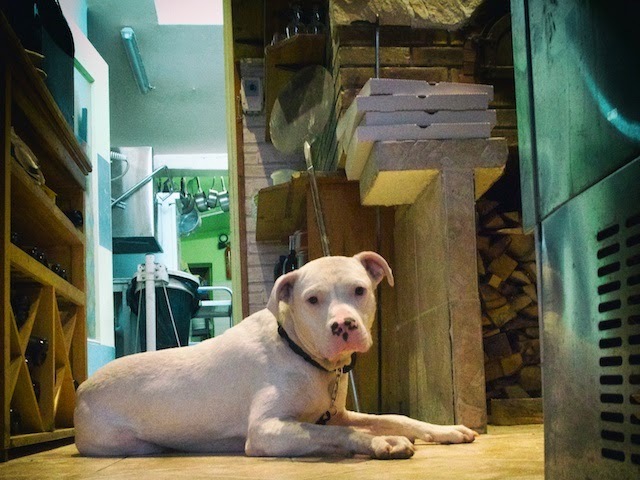 It was a very large dog as it happens, one whose job seemed to be variously warning customers that leaving without making payment was not an option, nor for that matter was returning after hours to obtain a refund when no one else was around. He managed to convey this message while not actually moving from his spot between the oven, the kitchen, the bar and the till, ensuring that everyone who had business in any of those places had to step over or around him to actually attend to that business. He was probably responsible for the decor and the music as well we suspect. If we had gone helter-skelter today, we may have broken our record for number of locks travelled in one day, and we may have broken ourselves or Mr Perkins to boot, but we almost certainly would have broken Dave or Ria or both! We had vague feelings of deja vu as we watched them battle with their first few downhill locks, eventually settling in to a routine that would stand them well for their trip into Paris. We traversed nineteen today before calling a halt at a very civilised but still late for lunch time, and covered almost four kilometres in the process. 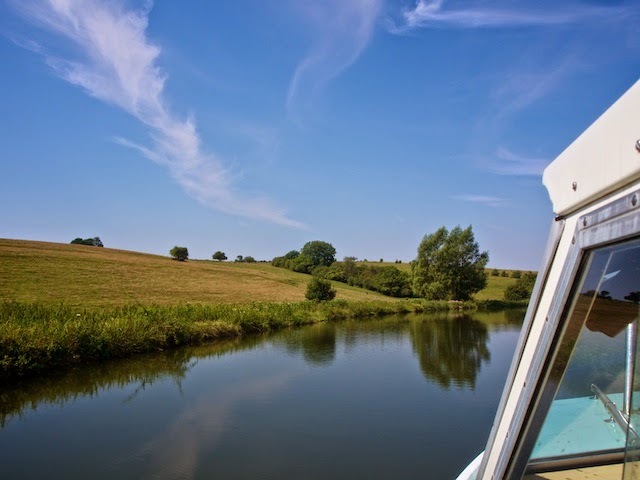 At every lock a new scene awaits, around every bend a new lock awaits, and often there’s no room for a bend between locks, but if there is a more pleasant way of travelling slowly through the haze of summer we are yet to find it. Even Mr Perkins, perhaps sensing a very big hammer at the ready, was on his very best behaviour all day. Was it just a coincidence that the sun was shining from the outset?